Although the above salutation may be inappropriate walking into a business meeting with a client who is about to finance your next project, it isn’t walking into a BBQ pit. Especially when it’s a pit located at 589 King Street West. If you are a lover of the Food Network, as I am, you have watched Diners, Drive-Ins, and Dives hoping that the wonderful Guy Fieri would pick you up in his red Camaro and drive you down south to experience the most fantastic barbeque you have ever tasted. If you’re a Bobby Flay fan, then you most likely caught yourself drooling when he challenged one of his viewers to a Pulled Pork Throwdown. Lucky as we are to be able to experience such tantalizing programming, it is sometimes tough to find those sort of home-grown restaurants and authentic experiences in our backyard. My quest for barbeque in Toronto began with my investigation of Phil’s Original BBQ. 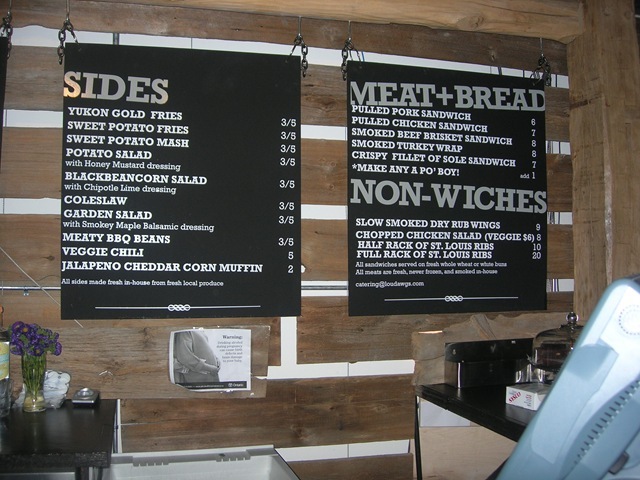 Canadian Chef David Adjey praised the restaurant for its fantastic smoked meats and its mustardy coleslaw which he advocated as a hit on Food Network Canada show Restaurant Makeover. I had to try it out for myself. Though it’s been a couple of years since that experience, here are the few things I remember. Although the smoke was wonderful, the pulled pork had a stringy texture and wasn’t as tender as I thought it would be. Space was another issue at their location. There was hardly any, and every diner in the restaurant was within elbow knocking distance of one another. 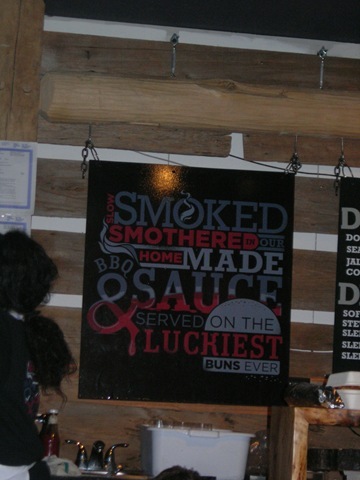 However, if there is one thing I will admit, it’s that their barbeque sauces were killer. This place definitely needs a revisit and a more focussed review the next time around. 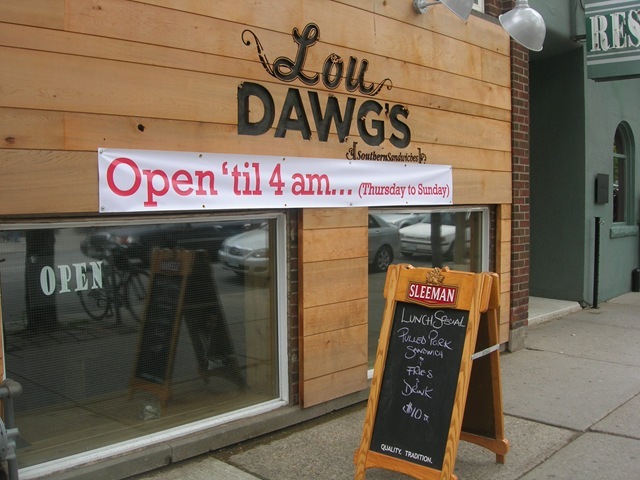 Most recently in the news, I kept hearing about a place called Lou Dawg’s that offered an authentic southern barbeque experience for under $10. Who doesn’t love a deal like that! It didn’t take much convincing to decide to make a trip to taste their wares. I researched their menu (as I always do when I go out to eat anywhere), and was impressed by their shortlist of 5 sandwiches. This was a good sign that the restaurant intended on being focussed in their efforts by creating a few quality dishes that they could feel good about serving. The restaurant itself had the feel of a woodsy cottage which was very appropriate in terms of theme. The wood plank lined walls brought comfort and warmth to the room, and were a reminder of the aromatic wood chip smoke that permeated the restaurant. 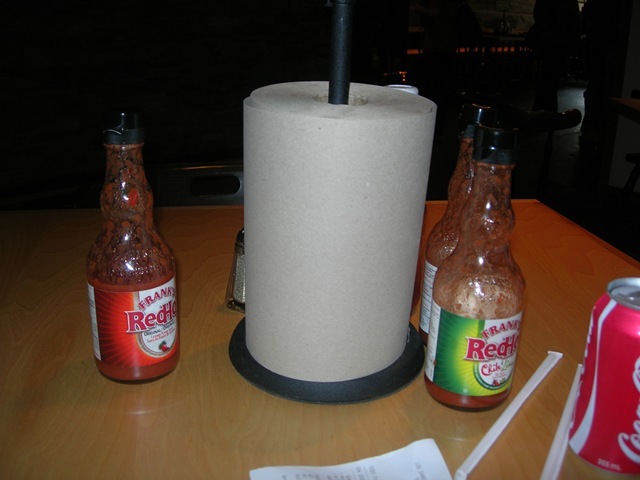 A roll of brown paper towel was held in place at the centre of each table and was flanked by three different bottles of hot sauce foreshadowing what was about to happen in the next few minutes. I ordered the pulled pork sandwich topped with coleslaw and a jalapeno cheddar corn muffin as a side. 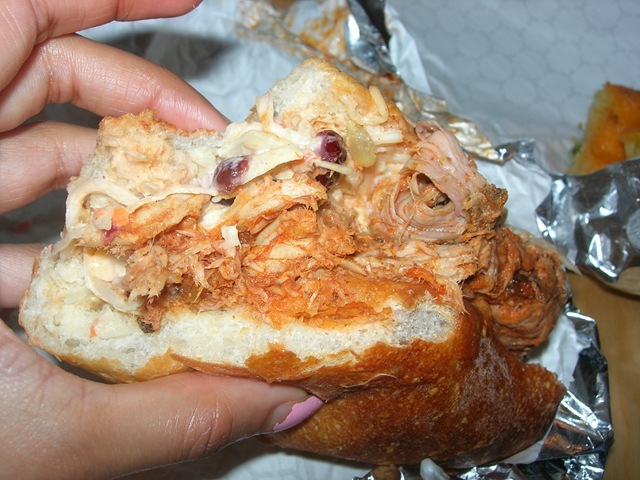 The addition of coleslaw was described as making a regular sandwich a “Po-Boy”. Although I didn’t agree with the terminology, I let it go, because who likes a stickler anyway? When the sandwich arrived, it took me a second to take it all in. Glossy Parisian baguette. Check. Enormous mound of pulled pork. Check. Coleslaw Mecca. Check. I could not wait to dig in. My first bite into this sandwich was glorious. The pulled pork itself was tender and succulent. You could really taste the flavour of the pork and the time and effort it took to bring it to its melt-in-your-mouth state. The smoke, although present was not overwhelming and complimented the meat well. I could tell this was good barbeque, because they didn’t need to douse their meat in sauce to make it appear tender. 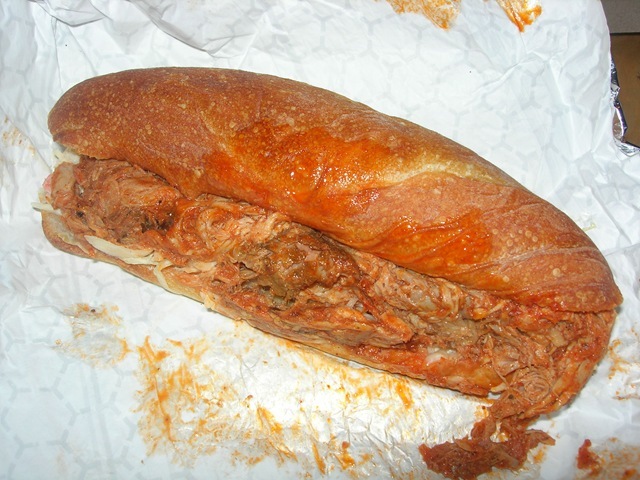 Additions of Frank’s Red Hot brought the heat and acerbic edge needed to cut through the richness of the pork. 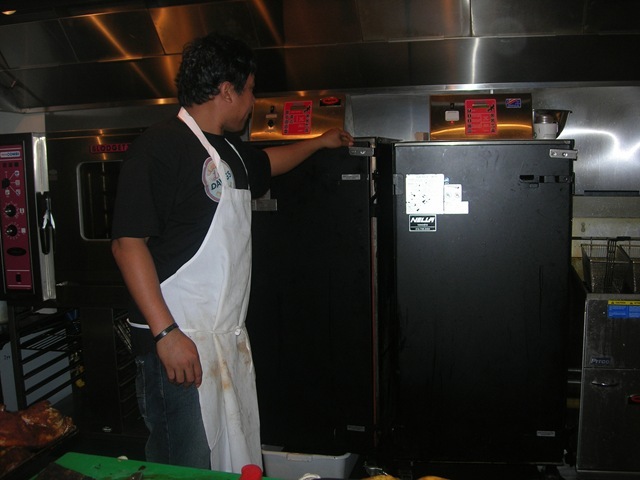 The meat could have been slightly warmer in temperature, but that’s an issue that management could easily correct. The coleslaw put the sandwich over the top. It was speckled with plump cranberries, and sunflower seeds and served as the perfect crunchy counterpart to the meat. I could tell that the owners were paying attention to the details. If you enjoy cornbread, then you will dig this variation. 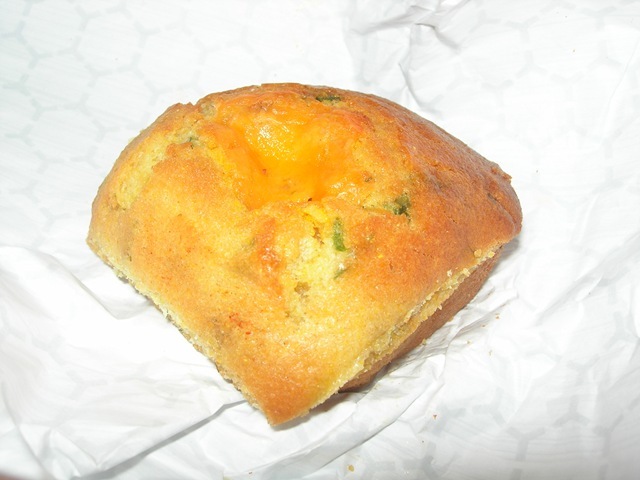 The cheddar cheese brought a savoury element to the bread, however the sharp edge of the jalapeno was somehow lost in the sweetness. This is definitely something to be enjoyed warm and gooey, straight out of the oven. I had mine at room temperature. All in all, my experience was fantastic. Our hostess Michelle was the epitome of courtesy. She made my stay all the more pleasant. So much so, that she took me out back to check out their smoking equipment and told me that I was the first one to ever take a glimpse. Now don’t I feel special? Here’s the inside scoop. 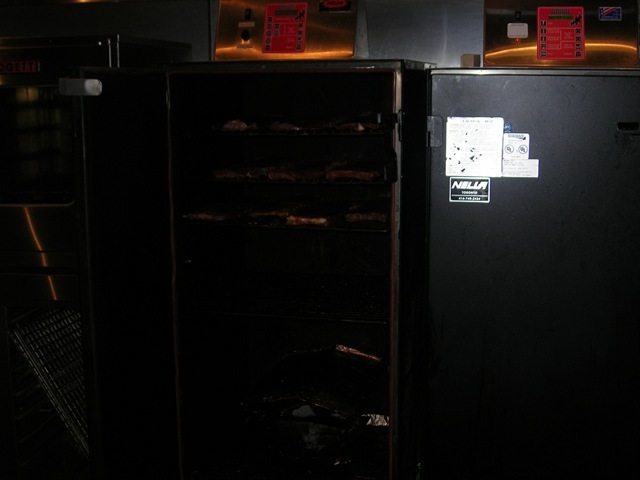 There were rows and rows of ribs that were being smoked. My hand felt like it was within reaching distance, but I refrained. Self-control in these sort of situations is hard to come by. I just noticed the veggie chili after you pointed out. I guess I was in a carnivorous frame of mind that day! I really want to try their cornbread! nice review Vijaya, love the pulled pork, need to try the ribs again.